I’ve been truly lucky to be able to call Sag Harbor my second home for a number of years now, but this summer, with some renovations of my own home underway, I thought I’d delve in a bit to the town’s architectural history. I just love Sag Harbor for it’s small village atmosphere, quiet Main Street, and scenic waterfront – it’s a welcome escape from my busy life in NYC and we use it all year round to recharge and restore. It has a magical energy to the place and I felt it from the minute I first came here. 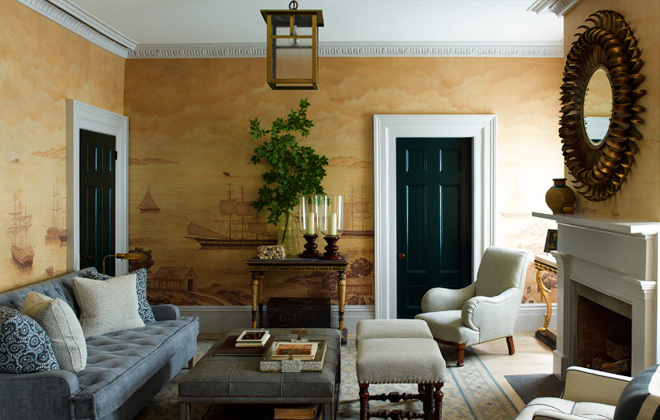 But it was actually this laid back Hampton’s neighbor that was first incorporated as a settlement back in 1730, and by 1760 the Port of Sag Harbor had become one of the highest volume trading posts on the East Coast. With its easy access to the depths of the Atlantic ocean, whaling became the number one trade operating out of the village. Hundreds of whaling boats soon began coming in and out of the port, and the village grew with inns, pubs, and basic necessities needed to maintain the new industry-supported commerce. 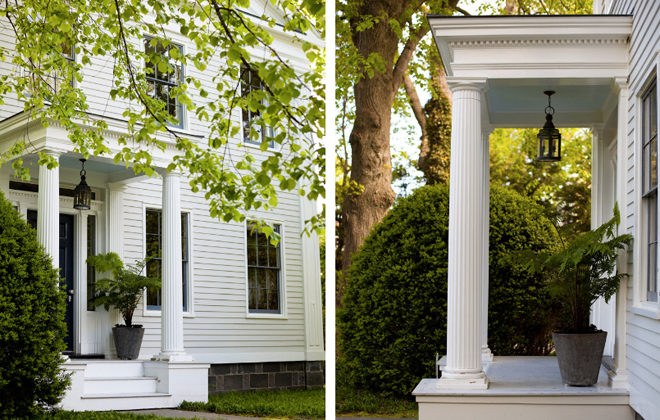 And with commerce, of course, comes homes – and does Sag Harbor have some beautiful ones! Although the village is dotted with quaint village cottages mostly built in the early 19th century to support the rise in industry popping up in town, a few grand old Captain’s Homes still remain. They are beyond beautiful. I will never tire of looking at them. 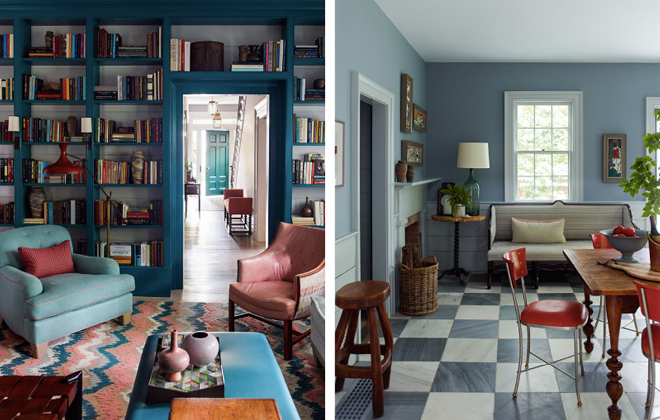 One home in particular has always caught my eye because it is restored and re-designed to perfection by the fabulous Sag Harbor-based interior designer Steven Gambrel. Built in 1835, “The Sea Captain’s House” is absolutely gorgeous, with bright cheery windows, double height ceilings and exposed rafters that give it that perfectly simple but chic Sag Harbor style that has only gotten better. I would love to walk up these steps into this kitchen, wouldn’t you? Can we talk about the nautical wallpaper? Genius. 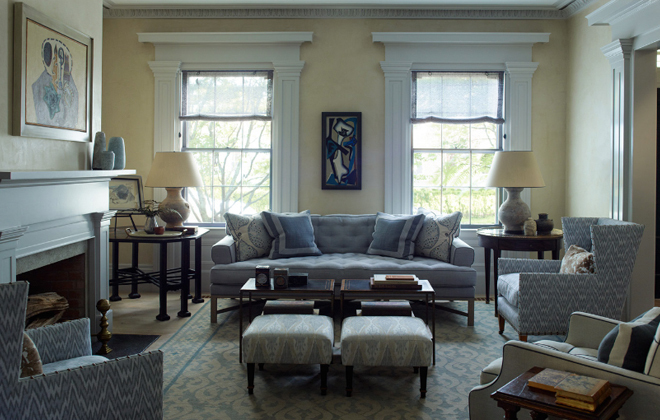 Gambrel really focused on the details of this project, aiming to maintain the main architectural elements, while updating the interiors with a contemporary flare. 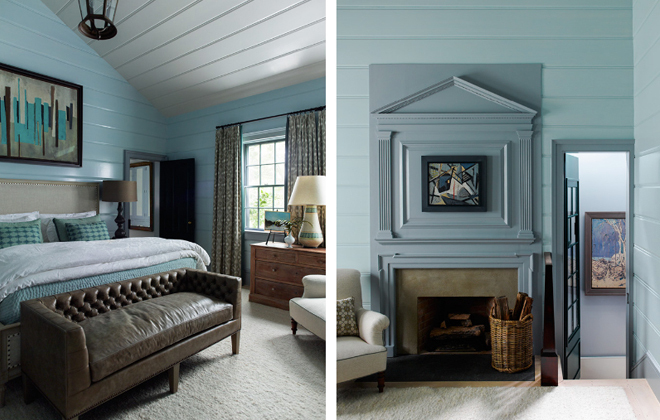 Using the original materials and detailing whenever possible, Gambrel created a masterpiece. 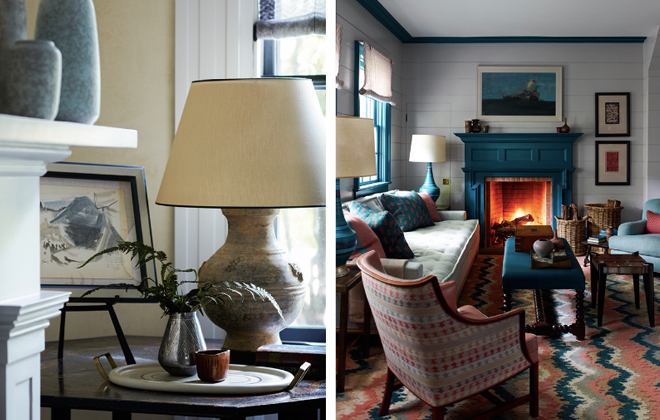 It comes together to create the epitome of an elegant yet relaxed beachy-home. Our fireplace is about that size as well. Looks quite chic in that deep turquoise blue. Might have to repaint. Very inspired by this bookcase wrapping around the entry of the room. And again, that color…. I think I would sleep really well in this room with a crackling fire on a cold winter’s night. 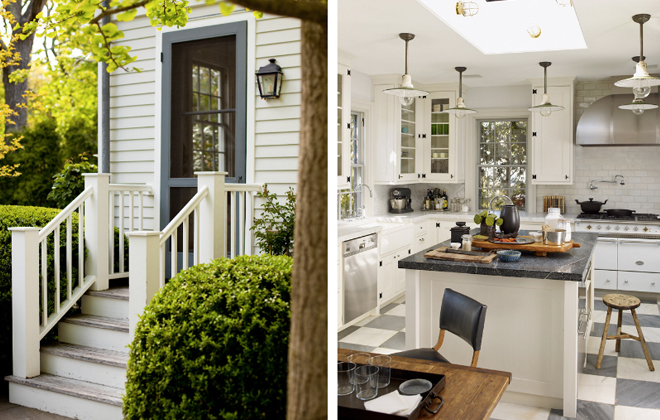 And Gambrel is no stranger to the restorative bug that has hit Sag Harbor! He was also the interior design lead for the Bulova Watch Factory project, which opened its doors recently and has reimagined the center of our village. The new Watchcase Factory condos were restored by the prestigious Beyer Blinder Belle architectural firm, bringing life back into the looming site which was in ruins since the closing of the factory in 1981. The sprawling 2.25 acre project holds 64 units, including those in the main building, and a number of cottages around the site, which were originally built for managers of the factory. Guess what? Our sweet little house was once a Bulova property as well! Cannot wait to share our house’s story with all of you. But that’s another story for another time. Stay tuned!